Love all of your masonry and concrete projects--knowing that you did them yourself!--with help from our experts. No projects offer more aesthetic or financial satisfaction than DIY concrete and masonry projects. Homeowners can routinely save thousands of dollars in labor costs by buying and installing materials that are readily available. 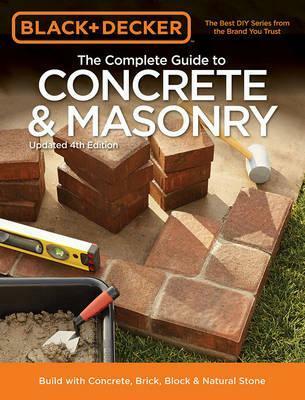 This updated 4th edition of Black & Decker The Complete Guide to Concrete & Masonry includes traditional techniques for laying concrete, adapted to make them easy for ordinary homeowners, and also features completely modern materials and techniques, such as tumbled concrete pavers, acid-etching for colored concrete slabs, and important green paving options, such as rain-garden arroyos and permeable pavers. Several cutting-edge projects, like polished concrete countertops and stamped concrete walkways, are included in this book. An exposed aggregate patio, a reinforced concrete block wall, and the latest tools and materials for handling new products are featured. A completely new section on foundation walls shows you all the options, including the latest structural insulated panels, that are now more DIY friendly than ever. No homeowner or do-it-yourselfer will want to miss this chance to master the best methods to create lasting beauty around the house.